Maximized temperature stability and a thick housing insulation made of high-quality, pressure-foamed material. 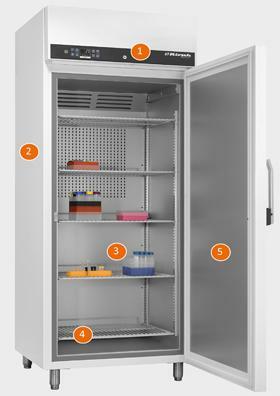 Each laboratory freezer guarantees a safe storage for your sensitive goods. The storage temperature can be adjusted between -5°C and -30°C depending on the model. KIRSCH is manufacturer. This enables us to develop our laboratory freezer constantly. Each device consists of a robust housing and high quality components "Made in Germany". This guarantees reliability and a long economic life-time which in return saves your money. The drawers/shelves are adjustable within a 15mm raster for refrigerators with the interior of smooth aluminium sheet. The longituduinal and cross dividers within the drawers are individually adjustable.